My guest this week is Reggie Wilkerson, Director of Enterprise Data Management at the State Department Federal Credit Union. Reggie’s one of the few guys that is really dominating data. While running my CIO Innovation Insider series recently, I noticed that a lot of conversations have been around data analytics, business intelligence, data warehousing, and data visualization. 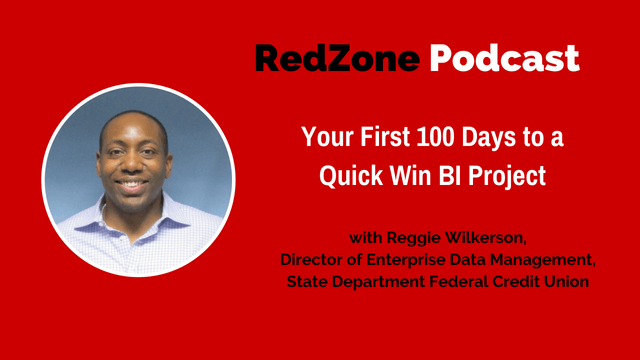 That is why I invited Reggie to discuss how to get your Power BI project started from the ground up and what would your first hundred days looked like. You are going to hear about the approaches and tools Reggie is using, how to shift perception and opinions within your organization and a lot more. I believe that the skills within this domain are very important and hope you enjoy listening to my interview with Reggie Wilkerson. Tableau – BI platform that helps you gain insights into data. SAP Business Objects – single centralized BI platform for reporting and visualization. Cognos – IBM’s analytics solution. Art of the Possible: Shift Perception + Opinion. When to ask for forgiveness vs. permission? How to know whether to move to the cloud vs. staying on premise? What are the roles of the end user and data architect? How to create momentum and “snowball effect”? How do you work with a CEO to build impact? How do you manage data quality and integrity with a BI, Data Warehousing, Data Visualization project? How do you know the data that you are governing that you have integrity with your data? How do you create the right SOW to have a quick win with your organization’s BI project. Reginald Wilkerson is the Director of Enterprise Data Management at the State Department Federal Credit Union. Reginald Wilkerson is an Analytics leader with experience in all aspects of Information Management including building out cloud based (AWS) target state solutions which streamline and automate the data sourcing, data management, data quality and enterprise reporting components. He is adept at reducing friction and increasing efficiencies by bridging silos, and he is also adept at designing analytics platforms which provide enterprises with actionable insights. In his free time, he enjoys reading tech blogs, listening to podcasts and finding a good pickup basketball games around the DC area. Bill:	I want to welcome you to my show today. Reggie:	[00:01:00] Well thank you very much. I'm very glad to be here. Bill:	You and I have talked extensively, and you've talked to the innovation group of CIOs. I thought the CIO of your organization was really ... I think Floyd was really in front of the mark, really looking when he hired you. I think he recognized some serious talent. I think he was very strategic, and I want to explore that [00:01:30] with you, because I think that understanding how you approached your first 100 days in the job is really interesting and different. And so, but also before we jump into there, let's talk a little bit about yourself. How did you get into the IT world? What's your genesis story? Reggie:	Yeah, so when I was in college, I wanted to go to law school, that was my goal. [00:02:00] I wanted to major in finance. I was really interested in corporate law. There's a few people in my family had went that route, and it was something that really, really interested me. So, what I looked to do was, when I got into the college of business, it was around the time the .com era. And so, I actually remember being in a finance class when the AOL Time Warner, when that big merger happened. We were actually looking at CNBC, and I was really [00:02:30] interested in that. And then, also, another thing that happened was, Microsoft came to do recruiting, and I actually went to that event one evening, and the energy was just powerful. It was just so much energy, and they were just talking about the future and all of the opportunities that they had. And so, at that point, I really was hooked, so I decided to change my major. So, I was able to stay in the college with business, and I just changed my major to a management information's systems. [00:03:00] And you know, it really kind of aligns with what interests me, because I was really into video games and computers growing up at a young age. I remember being around 12, and one summer camp that I went to for about two or three weeks was on some basic computer programming. So, it sort of aligned with what I was ... the thing that I was really interested in. So, yeah so, I majored in MIS, [00:03:30] and I was pretty good with data, spreadsheets. I began to learn SEQUEL while in school. I had to take C++. I had to take C. I had to take Cobalt. And I'm sure a lot of listeners may not ... they say, what is Cobalt? It's a pretty old language that very important systems on Wall Street still leverage. So, I had a pretty good background with the classes that I took. And from there, I was very interested in consulting. So, [00:04:00] once I moved up to the DC region, I was able to get hooked into consulting, which is really my goal. So, I think I’m really lucky. A lot of hard work and networking. But once I got into consulting, my roles became more data focused. I remember one of my first positions was a developer, so reports, interfaces, conversions and extensions. And so, pretty much I was writing PL SEQUEL, like hand code to bring in data from, I think it was the SAP system into a new [00:04:30] supply chain system for the department of defense on a pretty large project. And so, I've really got a chance to get my hands dirty. So that was really, I guess, the genesis of me becoming a data analytics professional, if you will. Bill:	Well, it's interesting that you were actually pulling data from systems that are very early on, and I think there's a great book called, Exponential Organizations, and it talks about the role of the CIO, CTO and [00:05:00] digital transformation leaders of the future are going to be those that are really, really strong at data feeds, APIs, linking systems together, and both on prem and in the cloud. So it sounds like you've kind of got a huge jumpstart in that. Reggie:	Yeah, definitely, definitely. When I got started in the early 2000s, there were definitely tools in place, such as Informatica, that help you kind of lift and shift data from source and pushing into a specific target. [00:05:30] I got a chance to do it by hand, again, with the PL SEQUEL. So, they just really gave me a great foundation in coding, and then just understanding data structures, you know, data coming from not just an Oracle database, which is the industry leader, but DB2, SAP. I learned [inaudible 00:05:49] programming, which was very similar to PL SEQUEL, but just having that frame, that strong foundation framework of knowing SEQUEL, I was able to learn [00:06:00] APIs, XML. Bringing in data from a variety of sources became something that I was able to build upon. So, I started there, that was the foundation, and then as I went to other projects, I worked with different technologies. It was something that I could easily grasp. Bill:	This has been around data warehousing, and this has been around for better part of 15/20 years that I've been [00:06:30] listening to these conversations. So, why is this such a big push now within, I mean just within an innovation group that you're a part of. In my conversations with people, this comes up so often now, people launching BI projects, trying to get better insights of their data, but this has been a challenge for years. Why is this coming on line as a big push now do you think? Reggie:	I think that the tools [00:07:00] have evolved. So when I first got started, a lot of the reports were still tabular in nature. You have your columns, let's say a report might have 15 to 10 columns, and then it can have hundreds of rows, thousands of rows of data. But now, you have tools like Tableau, where you're really gaining insights into that data. And a good dashboard, in my opinion, should spark, it should answer a question, but it should also spark more questions [00:07:30] from the business, or whoever that end user is, a consumer of that dashboard. So, I think a lot of the tools. The cloud has also fueled that. The processing power of servers, and obviously the cloud has brought that to the masses, if you will. So, I remember early on in my career, we'd try to push data, let's say a few, like 50 gigs of data. It'll go through the nightly run, [00:08:00] the batch run. We may run into issues with running out of heap size, or we don't have enough memory in place. Those things aren't as big a impediment as they used to be. You would see a lot of the larger corporations that had that on premise infrastructure that could handle those loads. They were really well ahead of the curve because of that. But now, the cloud has enabled, even the smallest organization can take [00:08:30] millions, and millions and millions of roads, and run it quite easily with a lot of the tools that are in place now. Bill:	So, a lot of the processing power, kind of the evolution of processing power gave access to the masses, versus just Wall Street or other resource, companies that had the resources to toss money at it. Reggie:	Correct. And in conjunction, also, I think the data based tools, right, again, Tableau, [inaudible 00:08:54], and even some of the other tools, Business Objects, Cognos. A lot of those, they started focusing more on the visualizations, right. A lot of the operational reports that companies use, it's funny. They may have 50 reports, but they may only leverage two or three. But what are the insights out of those 50 reports? And not being able to visualize what are those important KPIs, right, let's visualize it, let's put it on the actual map. Let's do a heat map. Having those tools, as well. So, I think [00:09:30] in conjunction with the processing power not being an impediment, has spurred the, I guess, the data analytics revolution, if you will, over the past decade or so. Bill:	So one of the big reasons I wanted to have you on the show is just from the raw practicality of getting, essentially a legacy organization off the ground with data analytics and insight from business intelligence [00:10:00] that you were able to get in. And I like that, because I think it's important for listeners to understand that most organizations are not going to be the pure net zero entrepreneurial organizations, it's going to be the bigger companies that need to get these projects off the ground, and you did it in a very strong, practical way quickly. And I'd like to talk a little bit about that, if we could explore a little bit. [00:10:30] And one of the questions I have for you, Reggie, is what did the first 100 days look like? And I know the answer to this, but did you walk in and say I needed a million dollars for a bunch of software first, or did you take more of a lean approach, and what did that look like? Reggie:	Yeah, I definitely tried to take the lean deliberate approach. So, I remember during the interview process, they stated that, hey we currently have a data warehouse, we have a BI product [00:11:00] right now, but we're not really leveraging it, so we need someone to come in and do that assessment, and determine how we can better leverage it. So that was really the first thing that I was focused on, taking a look at that legacy tool and platform that we had. I took a step back, I work with the end users. I try to go to every director, every department head, and meet with them to kind of talk through their data requirements, and the way they leverage data [00:11:30] on a day to day, week to week basis. And then, I took a look at the, you know, I took inventory of all of the systems. And so, once I did that, I determined what are the high impact use cases or high impact systems, and then I took that and I understood who were the constituents, who were going to be the consumers of that data coming from that system. And so, that was not hard at all, because really if you look at it, our core banking platform is really the heart of everything that we do. And so, that was [00:12:00] that initial use case. And so, once I identified that, I said okay, let's take a look at the current tools that we have in place. So, I really took a look at the needs and wants of the business, and I just cross referenced it against the actual functionality and everything that the current platform provided. And there was a definite gap there. And so, once I identified that gap, I took that, and that was really the fuel to me [00:12:30] to put together a roadmap and strategy, and then I met with the senior leadership team and the board of directors here, and I presented to them some of the gaps, what we're doing okay now. Here's where we want to be, and this is what we'll need. And so, I laid it out like that, and that kind of came from my consulting background, the approach that I took. Bill:	So, when you sat down ... this is going to get really kind of in the weeds, but I think it's going to be useful for people. So, when you sat down with [00:13:00] the department head, for example, did you ask them ... what were some of the questions you asked them? Did you ask them, could you print out your most important report that you look at daily or monthly? Like, what was the question you asked that then led you down a very specific track? Reggie:	Yeah, I mean, yeah, I definitely wanted them to print out those reports. I went out to the share drive. I actually set up folders for each of the departments, and I would grab their report. They could [00:13:30] print it out and I could scan it, or they could just send a soft copy to me. So, I literally did that. And then, really, it's just interviewing them. What types of reports do you have now? What would you like in the future? What are some of the gaps with the reporting right now? Can you walk me through the report production process? If it's something that is ... a lot of our reporting was sort of decentralized, and that led to those silos, and that's obviously an issue, as well, because the definitions [00:14:00] of certain KPIs, it may be the same KPI, but one department says the number is this, and then another department, the same KPI, the number is different, right. So, that was another key finding that I uncovered during those interview sessions. But really just kind of figuring out what is your current report production process, what are the reports and metric that you care about most that helps you get your job done, and also what are the systems that you must feed [00:14:30] in or export data out in order to produce those reports. Bill:	Yeah, I love that. So essentially, by grabbing that data, then you cross referenced it with the systems they were using. And was this tool they were using any useful as far as a BI tool that had in place? And you just had to then look at those targeted systems, and figure out a way to extract the data into a singular [00:15:00] data source, or was it simpler than that? Reggie:	No, that's pretty much it. You hit the nail on the head. And again, when I'm cross referencing ... let's say I had 10 conversations, and then I'm seeing a common thing, right. A lot of the data, not all of the data, but a lot of the data's coming out of the core banking systems. So that's our first use case. That's the first subject area that I want to build out as far as the data [inaudible 00:15:27], or data warehouse perspective. [00:15:30] Yeah, so that was really what I was able to tease out from those conversations. Bill:	So, what happens if you want to marry data from a public source to internal source? So for example, if the bank was thinking of moving into a certain region, and wanted to ... I guess, I'm not as familiar, but let's say they wanted to open a branch in a certain area. [00:16:00] Is there a way to get insight that is pretty straight forward for someone that can pull data from a public source, and then marry that to internal data? Reggie:	Yeah, and that was a common use case that in the past, we'd have to go out to certain vendors, and that may cost us 30, 40, 50 grand for just a marketing campaign, if you will, if you want to target individuals that meet certain criteria. Or [00:16:30] if we're looking to, again this is something common that comes up, right, in financial services and the banking industry, do we want to put a new ATM in a different location, do we want to open up a new branch? So that's a great question, and that kind of also marries back to that discovery session that I did within those first 100 days. I wanted to make sure that we had an analytical engine, or ETL tool, or data integration tool that could feed that use case. Because really, once [00:17:00] you're building out a platform around data analytics, you want to make sure that it's going to feed multiple use cases, not just your operation and reports, not just your dashboards and data [inaudible 00:17:10], but also if you're in a B to C business such as ourself, is being able to do targeting marketing. I mean, I think that's a big thing right now. It has been the last few years, and it definitely will be going forward. So, for us, we leverage Alteryx. And so, Alteryx, we chose it [00:17:30] because it was pretty easy to use. We like the graphical user interface. And also, it came with a data enrichment package. And so, within that package, we got census data, we got TomTom data, so we got like, the actually lats and longs so we could on the fly, we could determine driving distance. And of course, in the DC area, we know if something says it's 10 miles away, it may be an hour away depending on traffic, so that's given us a lot [00:18:00] of great insight with that data. And also, Experian. So we got tons and tons of data from Experian, and it's just been great for us. Our marketing department is always coming up with new ways that they want to slice and dice data, and different segments of our current customers. Or not even our current customers, but potential customers that we could market our products and services to. So, I think that's great point. So, we didn't have the infrastructure or the tools set in place, but that [00:18:30] was definitely on the list, and that was something that I was able to tease out of my earlier conversations during sort of the discovery phase, if you will. Bill:	So the initial tools that you had was really kind of a bolt on to your core banking system, and then an Alteryx was pulled. You were able to pull data, I guess you were calling it data enrichment, so that's essentially Experian and TomTom, and other third party data sources, you could marry them back [00:19:00] into this essentially middleware, [inaudible 00:19:06] you could then analyze the data against. Reggie:	Correct, that is correct, yes. Bill:	So it's funny, because the first 100 days, I think is really important. And obviously you had this kind of rich consulting background to fall back on, and then you were coming into a legacy organization, which by definition, [00:19:30] is not going to be probably moving at the pace of someone that's coming in from a big four consulting firm. So how did you navigate that so that you're able to show the wins fast? Is there a way that you ask for reports, or is it your gut instinct? How did you know where to look to get the biggest impact first? Reggie:	[00:20:00] That's also a great question, Bill. And definitely I want to dive into it, but so do all of the above. During those earlier conversations, I quickly found out that our loan servicing department was one of the largest departments, if not the largest here at the credit union. And also, with that being said, then they are also the biggest consumers of data and reports. And so, really, I wanted them to be that first initial [00:20:30] use case grabbing data from our core banking system around our loans. So, once I figured that out, I knew that our leadership team, they really care about the health of the credit union as far as our risk profile when it comes to our loan portfolio. And so, I determined that, okay, let me take an existing report. I went ahead, and I used my corporate card. I got a Tableau license, and we actually [00:21:00] built out something. And it was fascinating, because we didn't change the data at all, and when we initially brought in all of the leadership form the loan servicing standpoint, and then some of the senior team, one of the members of the loan servicing team was like, you know, this report isn't right. Oh, okay. What's wrong with the report? And they tried to point something out, and I said, you know, that's funny, I haven't changed anything at all. This is your existing report, we just [00:21:30] reimagined it with Tableau, with the data vis. So that was a really funny conversation in front of the group, but it kind of got everybody excited, and it got them to thinking about the art of the possible, if you will, having this new platform in place. Yeah, so really, that's sort of the steps that we went through in order to determine what was going to be the biggest bang for our buck. And so, once I did that, I also noticed [00:22:00] that I was having a bit of performance issues with Tableau, with the on premise infrastructure. So again, that good old trustee corporate card, I literally went to AWS, and I set up an account, got an X3 bucket, EC2. We placed it out there, and I went back to my boss, the CIO, and I showed him. I'm all about showing, and having tangible evidence, right. I said, hey, here's how it performs [00:22:30] on prem versus in the cloud, and it was really no contest. And from there, we built out a cloud, I guess analytic platform, and it just made sense for us, right. A lot of our infrastructure is getting toward end of life. And as an organization, we're looking to move into the cloud anyway. With this new platform, it just made a lot of sense to go ahead and build out that infrastructure in the cloud. So, once I was able to just get those quick wins, honestly, I was successful [00:23:00] because the business was happy. They were going back to our CEO, to our CFO, to our COO, and saying, you know, I'm meeting with Reggie, and you know, I kept hearing that in meeting with the senior leadership team. They're saying, hey, you know, you're working with X Y and Z around the organization, we keep hearing your name. You're doing great things. And so, they're excited. And so, the willingness to invest, seeing that tangible evidence, and I guess I got the capital to keep [00:23:30] moving forward. Quite honestly, I was in the mindset that I would rather beg for forgiveness, so I wanted to keep moving forward, and keep having those wins, but it just sort of was a snowball effect. I was able to get a team from Slalom Consulting, they've been an excellent partner that worked with us. The team that they brought over was just great. They were cloud aware, they had cloud skills and [00:24:00] AWS. And I really liked that they both knew the data vis side and the data based ETL or data analytic engine side, if you will. So, they could tackle a variety of things. They didn't have to go out and grab another two resources to work on something special, a special use case. They could tackle anything that came their way, so they've just been a really great partner for us. Bill:	I'm going to come back to the team that would be required to get one of these off the ground, [00:24:30] but just to confirm, so you move your systems into the cloud after your proof of concept, and essentially you have an Amazon, a Tableau. Tableau, Alteryx and [crosstalk 00:24:45]. Reggie:	Yeah, Alteryx. Yes, correct. That is correct. Bill:	And then, your core banking stuff obviously is not there, but you can import it into those ... I'm assuming you can import it into Tableau, and massage it as needed. Reggie:	Yeah, yeah. [00:25:00] Yeah, exactly. So, we have daily extracts that are run each night. We grab that data, we place it up into X3 buckets up in AWS. From there, our jobs from Alteryx, they go in, they massage the data. They enrich the data, they cleanse the data. And from there, it goes into Redshift, and then Tableau is in on top of Redshift. Bill:	Now, the Alteryx is basically those three, like, that's what pulls in the Experian data. The [00:25:30] TomTom and [inaudible 00:25:34], I'm guessing a variety of different third parties into that. Is that what the purpose of Alteryx is? Reggie:	Yes, that is correct. That's our engine, if you will. I'm calling it an engine, but it's really known in the industry as an ETL tool, or data integration tool. Bill:	Got it, okay. ETL data. Okay, perfect. Now, one of the big things that's coming up in the group is the skill sets required to pull a project off like this, and clearly [00:26:00] you were you, so you were one of those skills that was needed, and then you just mentioned Slalom. Now, what's the strategy? Is the strategy, you wanted to get it built fast, so you used some specialized help and labor? Are the longterm approaches that you want to build some talent internally, or you're just really going to make it the end, you're going to teach the end users how to run these reports? Like, where are you going to build internal teams, versus [inaudible 00:26:30] [00:26:30] external. Reggie:	Yeah, so, internally, we'd love to have, within each of the departments, have like a Tableau [inaudible 00:26:39]. And they may not need to understand everything that's happening in the analytical engine, that middleware if you will within the ETL tool, but they should be data aware. They should understand how to build out all of the dashboards and reports that are needed. They should understand that I have data on this table, [00:27:00] data in that table, and another table, how to join those three tables together to produce a meaningful report for the business. So that's what we want to build internally, and we're definitely going down that path right now. As far as our specific decision, it was really looking at, it might have taken us a while to build out an internal team with all of the skills that were going to be needed for us going forward, so it just made a lot more sense to leverage the consultants [00:27:30] from Slalom, the team from Slalom, because we were able to get so much done in the last year with their help. They've just been a great advisor and a partner to us. As far as going forward, once Slalom leaves, we want to have a data architect, right, that can understand how to build out a new subject area, bring in data from new systems, right. As we continue to evolve, we will always have new [00:28:00] transactional systems, different types of data, so we want to have a person that's sort of data aware, if you will, that data architect role. And then, we want to have analysts, analysts that can do a variety of things, right. They can assist that data architect in profiling data in a source system. Building out ETL jobs to bring in the data from its source to the target, and building out the dashboards and reports. So, we want to have a strong centralized [00:28:30] team that is more technical, if you will, but throughout the organization, we'd love to have, I guess, ambassadors of Tableau and just this whole movement. Bill:	Of all the tools that you're using, is there ... kind of following [inaudible 00:28:49] principle, like 20% of pretty much anything gets you 80% of the results. Is there 20% of the tools that you just have to [00:29:00] dominate internally to be able to realize the vision, or at least get you 80% there? Reggie:	Yeah, I would say just having ... and again, Alteryx is great. It's really fueled our use cases, but there are definitely other tools out there in the market that can do similar functions. So I would say making sure you have a data integration tool, right. And that doesn't matter if you're on prem or in the cloud, you need to have a data integration [00:29:30] tool that can fuel multiple use cases, that can bring in data from XML, database obviously, APIs, obviously that's the big thing now, and definitely going towards the future. So being able to ingest a variety of data sources with that data integration tool. From there, there's certainly tons of different data vis tools that are out there. We think that Tableau is a market leader, and it's been great for us, but certainly Power [00:30:00] BI has a lot of great functionalities as well. And there are others on the market as well, like Looker, Good Data, and a few others from a data vis standpoint. Bill:	[inaudible 00:30:12] some good data analytics tools. And [inaudible 00:30:16] in the data vis, there's power BI, and Looker and Good Data. Is there any good ETL tools that you like? Other than the one you have. Reggie:	Yeah, sure. We looked at Tableau. Tableau is a great tool. That was [00:30:30] the tool that, I guess that was the runner up during our tool selection process. It's from a data integration standpoint. Also, Informatica. Informatica has really been a market leader, I would say, for at least the last 15, 20 odd years. Excuse me. And also, Oracle Data Integrator is a great tool as well. And then, if you're cloud aware, if you're in the cloud, and I can speak for AWS, not so much from a Google Cloud or a [inaudible 00:31:00] [00:31:00] standpoint, but AWS Glue is a really lightweight application that you can leverage. And it's pretty cool, because you don't have to pay for the server space, so you only pay for the orchestration. So if you run in a back spot that's at night, you only pay for that three or four hour window, you don't have to pay for an EC2 server instance that's running 24 by 7. So, that's a lightweight tool that's gaining [00:31:30] lots of functionality, and the price point makes it very competitive. Bill:	Yeah, i had the Google guys on the podcast a couple months ago to explore their cloud architecture, because I think it's not quite as well understood. And they talked a lot about Glue, and the orchestration products they have, so I thought that was very, very interesting. Reggie:	Definitely, definitely. And I think going forward, [00:32:00] right, when more and more data is in the cloud, right, from a storage standpoint throughout the three main cloud vendors, I think AWS is a little bit ahead of the curve as far as an ETL tool. I think that's going to be a big disrupter in the data integration market. Because all your data's already in the cloud, so why not just leverage a cloud aware or cloud data orchestration, or data analytical engine while it's up there. Bill:	Yeah, that makes a ton of sense. [00:32:30] What about driving revenue or driving profitability? You're in the early stages here with a major institution, kind of maturing your daily analytics capabilities. Are you focused on the opportunities for revenue enhancement, profitability? Like, is that ever [00:33:00] in your mind that you just kind of want to make obvious wins there, or do you just kind of let the business? Or is it more organic than that, and not so directed? Reggie:	No, I want it to be organic. I want the business to understand the power of the data, and also for them to kind of think of the art of the possible in different ways to slice and dice data in different business scenarios that we could run through in [00:33:30] the analytical engine. But certainly, that's something that I've spoken to our CEO quite a bit about, and we've had some great discussion where we've sort of white boarded and talking through a few use cases, and then I've kind of gone back and worked with that specific business unit in trying to get something built out where we can either analyze our current products and services, or look at ways to grow our portfolio of loans, things like that. So this is something that's definitely [00:34:00] top of mind. And long-term, right, we want to be able to show that this has helped us from an efficiency standpoint. As far as the report production process, we've taken a lot of the friction out of that process. But also, this tool has helped us with growing the business from, again, that targeting marketing campaign, our use case that we leveraged our platform for, but also this is also taking a look at our current portfolio, and saying, all right, [00:34:30] these are some underperforming loans. Here's some of the characteristics of those members, or here's some of the higher performing loans and account, and here's some of those characteristics. So, definitely, this is something that is certainly top of mind for me and the senior team. Bill:	Yeah, that's interesting, because you'd almost make a portfolio of different projects where, you [inaudible 00:34:51] have in like your top 10 list and estimated impact on the bottom line. And just driven by insight. Driven by [00:35:00] insight, and driven by data, and kind of almost ripping the opinion away and just making data just be data. And then, the opinion can be applied to the data, but not the reverse. That must be very interesting to a company. Reggie:	Yes, it is very interesting. And as we've gone through his process, that has been a great sense of pride for myself and the team, all the hard work that we've done. Because in the last [00:35:30] six to eight months, any meeting, cross functional meeting, or if it's just an internal department meeting, they're using dashboards to drive the meeting now. I know a few weeks ago, there was just a slight issue with one of the reports, it wasn't refreshing, and they were willing to just reschedule the meeting, because they really wanted to look at the data, and have the data drive the discussion. And so, definitely I've seen a culture shift during the time that I've been here over the past year. Bill:	[00:36:00] Is there ever a concern that you have of data quality? Like, how do you govern the data quality piece? Because I would imagine these reports can be so powerful, and the visual effect can be powerful. What if the data's wrong? Reggie:	You know, that's a great question. So, during our process, right, during that initial process, no matter which subject area we've built out, or what our source system has been, [00:36:30] one of the first things we want to do is profile the data. And another real huge benefit of having an analytical engine, or having something that has out of the box functionality to help with that, such as Alteryx, we can go in and profile the data. And let's say we're just looking at a simple table, and this table has, let's say seven columns, and then we're going through the data. It will pinpoint anything that's out of the ordinary within the data, right. If everything [00:37:00] looks like it's X, Y, Z within a certain column, and then there are few rows that have four, five, six, seven, eight, you know, that's an anomaly. So, using those tools, you're able to pinpoint and highlight those issues with the data. And what's even more powerful, is now, you can go back to the business, you can go back to that system owner. You can reach out the vendor, and say, hey we've noticed there's an issue, and here's the specific issue that we're [00:37:30] seeing. Can you patch that hole? Because one thing that I've seen throughout my career in consulting, is I think that some report consumers think that BI should fix the data for them, or really garbage in, garbage out, right. If the data is bad in the internal source system, or that transactional system, it's going to be bad int he BI reports no matter how powerful, how well you design your star scheme, if you will. So, I think that's a huge [00:38:00] part of the process, and we don't take that lightly at all. And again, we partner with the business, we can go in and have those [inaudible 00:38:07] with them. They can literally bring up the transactional system. We can kind of walk through it. This is what we're seeing in the data, can you show us on the front end? And you know, we're putting more controls in place, so some of the freeform text fields that we had in the past are now, hey you can only put certain types of data. You know, three digit characters [00:38:30] within this field. Before, it was just freeform text, you could just put whatever in the field, and we don't want to leave it a chance. We're all human, right? You're going to make certain errors. You want to make sure that you kind of gotten that locked down. So, yeah, that's an important part of the process, and that's one that we've certainly not skipped over here. Bill:	How do you govern someone making something private? Well, I should ask the question first. Are you pushing the ability [00:39:00] to generate reports down to the users at this point? Reggie:	At this point, yes, we do have a few sort of those Tableau ambassadors sprinkled throughout the organizations. And yes, the definitely have the ability to author and produce their own dashboard and reports. That's always a big discussion point, is you kind of want to take the governors off the system, right, and allow the business to have the full power, [00:39:30] but you sort of have to do it in phases, and you also have to make sure that you have controls in place, right. Have a governors team set up where your reports are being produced, and the numbers are off, like the member counts can be off. It's like, all right, where did you get that data from? You should have gotten a member count number from this table, this system, right. So, just making sure everyone is on the same page. But we certainly don't want to stifle that innovation, and that thirst for data, thirst [00:40:00] for answers, if you will, just by producing their own. Bill:	Yeah, it's an interesting challenge, the governance as you move it out to the end users. Obviously, the real power comes from enabling the users to get access to their information, but I can see your point 100%. 100%. If there's anything you could learn from all of your experiences, like all the way back from even the SOW that you were crafted to help you build the system. Is there any ways that you would craft your [00:40:30] statement of work, or craft the way you went about this project, or any project really, because you've hadn't handled so many, that you can say no, if you just do it this way it would be much better in a roll out, much better in from any angle. Reggie:	I'd say to either place it in your SOW, or know beforehand what is your [00:41:00] infrastructure, how does that look like. Again, I had to go out and kind of take it in my own hands, but you know, that was a risk, right. Not having the proper infrastructure in place. We had the team come on board from Slalom. I had procured certain tools where we didn't have the infrastructure to support it. So, I think really that environment installation and configuration is very important, making sure that is a part of the SOW [00:41:30] if you don't have that taken care of already, right. You may already be in the cloud, or you may have an on premise infrastructure that can support your needs. So just making sure that, that is a piece of it. Then, just really ensuring that you give yourself proper time for that initial discovery phase. You don't want to short change that. I think that's very important, because you want to make sure that ... let's say you already have some tools in place that you want to leverage, right. You don't want to go out and procure [00:42:00] all new tools, you already have some stuff that can be salvaged or usable for your use case. So, you want to make sure that, all right, we have this tool in place, and these are our sources, initially. Can we connect to that source with that analytical tool that we have in place right now? So, just making sure that you give yourself enough time in that discovery and design phase. Because you will really learn some real interesting use cases. The more that you meet with the business and explain the process, [00:42:30] the more that they'll be able to wrap their heads around it and provide you that input, right. So, not only just going through their processes, but just kind of teasing out what are some of the data points that you really need, right. And so, you may find out that the first week, or the first set of discovery sessions that you've had with the business, and then week two or three. The amount of information, and what you've learned, just can grow exponentially, right. And that's just going to continue feeding your use case so [00:43:00] you can make sure that, that first initial phase can be that big bang to continue getting that momentum, because you really want to build that momentum and ensure that everyone is excited, and you'll build something that's going to last and kind of really build upon the platform that you're looking to build out. Bill:	As we wrap this up, I just wanted to see here what your vision is for the industry as far as being able to get access to specialized [00:43:30] talent and labor. Do you see any opportunities existing where people, companies can subscribe to on demand talent, or labor, or thinking or expertise that could help with projects like this? Do you see any of that coming on online anywhere? Reggie:	Yeah, I think that's a big barrier to entry, honestly, for a lot of organizations right now. It's just having access to talent, and the right talent to be quite frank, right. [00:44:00] So, yeah, I could totally see that in the coming months, really, months and definitely years, where there's a company or a set of companies that have talent on demand. Because definitely every use case, every company is totally different, right. There might be a credit union that's maybe 10 miles away from us, but what we care about, our business questions are going to be totally different from theirs. [00:44:30] But having talent that understands data, understands data structures, understands how to source data, how to massage it, how to visualize that data. You know, that kind of transcends, really, industries, right. Because I didn't have a background in credit union at all. This is my first. But I just came with the training. I was just kind of data aware, a little data literate, and I understood the process, and I could bring in the approaches that I learned, [00:45:00] and sort of massaged and enhanced through my years in consulting, and utilize it here. And it's still been successful, so it kind of goes, transcends any industry, if you will. So, I can definitely see that there is some sort of team set up where they can come and be your on demand skill set to get you through a few use cases, even if it's something where they're only there for a month or a few weeks, or you've decided that you want to hire a team, [00:45:30] and maybe they just come and they just sort of do a little bit of handholding, you know, get the infrastructure set up, just kind of test the connectivity, help you with that initial design. I think just getting the gears in motion, and just having the right resources to help with that, is definitely something that can be learned. And I think right now, it's so hot in the industry, I think there's a growing appetite for folks that may not have this background, but they want [00:46:00] to jump into it. So, I think that would be great if organizations can begin doing that, because just passing that knowledge along, and then just having people just getting their hands dirty, right. It's one thing for it to be theoretical, but it's another for you to really get your hands dirty and to really start leveraging the tools. And that's really how you learn. Bill:	Yeah, and that's why I really appreciate you for coming on and sharing this, because I [00:46:30] just hope this vision to the CIOs being the CEOs of the future, and or just deeply partnered with the CEO, and because of the skills and the insight that can be obtained from the projects that you've undertaken. And you've proven that. And it started like right at the worm's eye level, like right ... that's why I asked those questions about the end users. But now, you have the visibility all the way up to the board and the CEO of a [00:47:00] major financial institution, so I think that that's a very, very powerful story. Reggie:	Yeah, no, thank you very much. Yeah, it's been a lot of hard work with myself and the entire team on the business, as well as the consulting team and my internal technical team. But it's been very, very rewarding. Once we got that infrastructure set up, it's just, our productivity just really skyrocketed, and that just goes back to all of the benefits [00:47:30] that you hear about, as far as going to the cloud. Now, not being in consulting, being on the other side, I have realized those. And then, just really staying close to the business during the entire time. We're their partners, and we kind of want to walk in step with them to ensure that as we continue to iterate, we're building something that's both meaningful for them and that's going to provide insights to them to continue doing their jobs in a more productive and efficient way. Bill:	Well, [00:48:00] I have a little side question for you. When we started out, I asked you what you had for breakfast. We've done this a couple times, and I thought, gosh, it's a very healthy breakfast. And I think you're a weightlifter, aren't you? Reggie:	Not really a weightlifter. I played football growing up. In my first year in college I got hurt. But I've always stayed in shape. Played a lot of pickup basketball. Even when I traveled as a consultant, [00:48:30] I would always find a basketball league to play in. I stay in pretty decent shape, and I try to do a five times five, five by five workout, something that I learned about, about seven, eight years ago. Some guys at the gym, they started talking about it. And so, for me, right, I want to make sure that I get in there, and 45 minutes I'm done. So, I like doing bench, dead lifts, power cleans, military press. [00:49:00] I only do about seven or eight exercises in a given week, so I just try to do the compound list. Reggie:	I wouldn't say I'm a weightlifter, but I try to stay in as decent shape as I can, and I try to eat as chelate as I can. Bill:	Is that the five by five, is that five days a week by five compound lifts? Is that basically what it is? Reggie:	Yeah. Yup. And when you do it, you do five reps and five sets. So five sets and five reps each. So really, trying to find [00:49:30] a weight where you're really challenging yourself. You don't want to do something easy, and like, oh, I'm done with my 25 reps. So it's really just trying to find that sweet spot of where you're straining, you're really putting stress on yourself, but you get strong. You get strong really quick doing the five times five. So it's really been beneficial for me. Bill:	Yeah, that five is a number that I cycle down to. I'm there right now, and you're right. It's very heavy, [00:50:00] because it's only a short amount of reps. And to do that five days a week. What about recovery? There's no issues with recovery? Reggie:	So, I do it the five sets and five reps. I don't do it five days a week. I do it about three, three to four days a week. Reggie:	So, I definitely try to get my rest in. And like this morning, I did Orangetheory. And this afternoon, I'll just do a circuit. And then starting tomorrow, I'll be doing five times five again. So, [00:50:30] I'll do squat, military, bench in a row. I'll do the row where you kind of sit down, where you're kind of standing up, and you're leaned over doing that bar barrel row. Reggie:	Yeah, that'd be it for me. I may just do some quick intervals. I'll just do a mile's worth of intervals, right, I'll just go as hard as I can for a minute or two, go down, you know, and then that's it. 45 minutes to an hour, I'm done. Bill:	Oh, wow. That's fantastic. I love hearing that. I learn something [00:51:00] new every day. Well, listen, this has been fascinating. It's going to be very, very useful for the larger community, I know. It was a lot of fun hearing about your approach, your thinking around it, and the tools you've selected, and how you're executing, and I really appreciate that. How can people reach out to you if they have questions? This is going to go onto our blog and onto our show notes. Is Linkedin okay? [00:51:30] Twitter? What is your preference? Reggie:	Yeah, Linkedin is my preference. So, anyone that has any questions or would like to learn more about the process and our whole story, and the platform that we've built out, please feel free to reach out to me on Linkedin. Bill:	Fantastic. Well, this is great, and I appreciate you very, very much, Reggie, for hoping on. And hopefully we can do this again in the future. Reggie:	Definitely, this has been fun. Thank you so much for having me, Bill. I really appreciate it. Bill:	All right, Reggie. Thank you. Bye. This entry was posted in Blog, podcast and tagged Big Data, Bill Murphy, CIO, CISO, cloud assessments, cloud security, data, Exponential Technologies, Governance, information, innovation, IT, IT Security, leadership, management, RedZone, Redzone Podcast, RedZone Technologies, security, SEIM, software, solutions, Tech Experts, technology, visualization on July 20, 2018 by Bill Murphy.